Are you finding delicious peaches in your grocery stores, or better yet fruit stands? There's nothing quite like a juicy, ripe peach! Don't you love how the fruits change with the seasons? I couldn't get enough berries last month, and now I'm loving the peaches and getting excited for apple season. So many things to enjoy! My mom had this fresh peach pie made for us when we went to visit a few weeks ago. I hadn't had homemade peach pie in quite some time, and let me tell you I have been missing out! This pie was everything you could possibly want in a homemade pie. I honestly savored each and every bite because I didn't want to forget the taste. This recipe came from an old Wellsville, Utah Ward (a congregation in our church) cookbook. Barbara Woodward contributed this recipe (thank you, Barbara!). My mom had never made it before, but is sounded easy enough and good enough that she gave it a try. Well, we were all certainly glad she did! I don't know about you, but I haven't made too many pies in my day. But doesn't this one sounds completely doable? You could make your own crust, and I might be tempted to just so I could make some individual peach pies in jars, but with a store-bought crust, there's really not a whole lot of complicated work involved. Even for a beginner cook, slicing, blending, boiling, and chilling are a piece of cake (or pie in this case!). 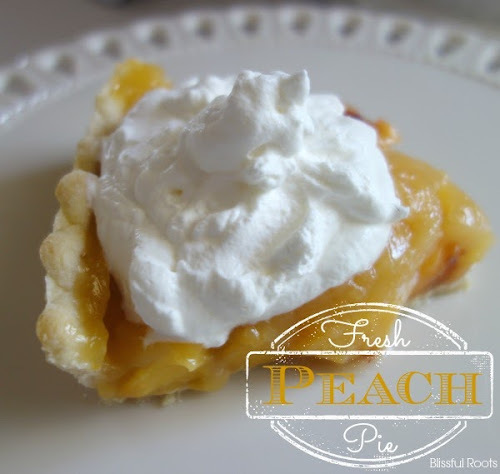 My mom made this pie with peaches she found at the grocery store, and it was amazing! I believe the key to this pie is finding the perfectly ripe peach. Grocery stores can be hit and miss, but you almost can never go wrong with local fruit stands. Church cookbooks are the best, aren't they! I promise this recipe won't disappoint! Hope you're doing well. I sure enjoy seeing your smiling face around blogland. Have a great day! OMG! This looks so good and your photography is amazing! I would love for you to come share at the From the Farm Blog Hop this week. We'll be favoriting all the peach linkups from this week at next weeks' party, so be sure and link up before Thursday to be included! Thanks, Lisa! I'll head on over right now. Have a great day! 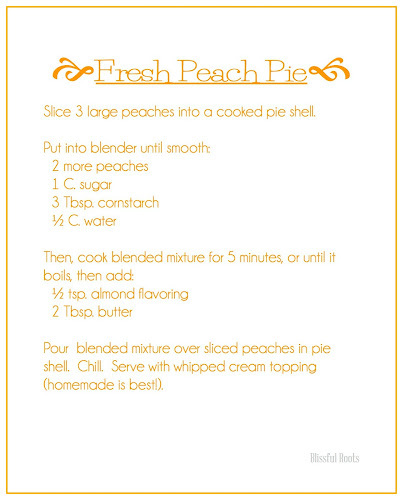 This pie sounds fabulous, pinning to my Pie in Your Face Board :) Found your link on the Super Saturday Show & Tell! Inviting you to link at our SUPER SUNDAY Link Party, we love pie & so do our followers! I am not much of a baker at all! My husband asked for a peach pie. This is my 2nd time making it. It was easy and delicious. I was very proud of myself. Thank you for such an easy recipe. I'll make this more often. Have even thought of experimenting a wee bit and putting in apples. hey, just wanted to thank you for this awesome recipe, I made it for the kids and they absolutely loved it. They wanted to meet the person who i got the recipe from and I told them I got it from a blog online. Everyone loved it and we enjoyed last night. Thank you so much and keep it up. Im going to be checking back next week to see whats on the menu. lol.